1. Experience – Conservation Mart have been assembling Energy, Water, and Weatherization Kits since 2009 and have had the honor to serve hundreds of customers such as Utilities, Water Departments, Weatherization Agencies, and Corporations. 2. 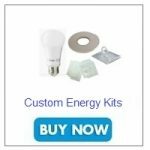 Customization – We have both energy and water kit assortments based on items that customers have ordered as well the ability to do custom kits. 3. Packaging – We offer a variety of packaging options such as Ziploc bags, boxes, or canvas bags. 4. Inserts – We can include any inserts that a customer wishes to provide. Most customers opt to provide their logo and contact info which we include in our kit insert. We have also printed bilingual inserts, with English on one side and Spanish on the other side. 5. Include your Logo – We offer a selection of personalized, eco-friendly promotional products. You can have company’s logo printed on many items, such as a shower timer, temperature gauge, water ruler, or LED nightlight. Our customer service team, located just outside of Atlanta, Georgia, makes your satisfaction our first priority. Call our toll-free number: 1-800-789-8598, and you will be greeted by a live person who will be able to give you a quote and help you build your kits.